Go here to print a coupon for $0.75 off Hellmann’s mayo 22 oz. or larger. 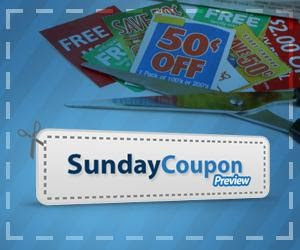 There will be two coupon inserts in this Sunday’s newspaper – Proctor and Gamble and Smart Source. Head here to see a complete list of the upcoming coupons. I went to Target tonight and discovered that toys have now been clearanced to 75% off. My Target rarely goes higher than 50% off. I picked up numerous items that I plan on selling on ebay. While I was there, I picked up 2 $0.88 Lean Cuisine meals ($1.88 – $1.00 Target coupon) and free StarKist tuna ($0.99 – $1.00 MQ). $349.30 worth of Target merchandise for $85.65!! Yipee! Have you ever wondered what Meijer’s coupon policy is? You can find it posted on Meijer’s website here and I have also put it below. Be armed with information about stores’ coupon policies. It is the most effective way of saving money – and the least frustrating! We accept two kinds of coupons; Meijer issued coupons and manufacturer coupons. Only one manufacturer coupon and one Meijer coupon for the same item will be accepted (unless prohibited). Mealbox coupons are considered Meijer coupons. We accept all valid internet coupons. See store for details. If the value of the coupon is more than the price of the item after discounts or coupons are applied, the value of the coupon will be applied up to the price of the item. We do not apply the excess value of a coupon to the order total if the value of the coupon is over the price of the item after discounts or coupons are applied. Only coupons for products carried in our stores will be accepted. All coupons should be given to the cashier while you’re checking out and cannot be applied to a previous purchase. Do you ever shop online? I get paid through a company called Ebates to shop online. Here is how it works. You sign up online and then shop through store links on Ebates. There are often coupons, discounts, and free shipping codes available on Ebates as well. In addition, if you have a coupon code that is not on Ebates, you can use it on the manufacturer’s website. Ebates will pay you a rebate based on the amount that you spend at a store. This rebate generally ranges from 2 – 6%. However, there are some stores that offer as much as 25% in a rebate. Ebates mails out your rebates in the form of a check that can be deposited into your checking account. Checks are mailed quarterly. The next mail out date is February 15th, 2010. So far, I have earned $81.47 in rebates and a $10 gift card to Target (special promotion when I signed up for Ebates). I buy nothing online until I check to see if Ebates offers a rebate for shopping through their website. You can sign up for Ebates by clicking on the link below. You will earn a $5.00 new member bonus just for signing up. You must earn an additional $5.oo before a check will be issued to you. Happy shopping! Go here to get a coupon for 10 % off one item (the most expensive item you purchase) – instore and online. The coupon expires 1/24/10. SwagBucks Code in the Toolbar! There is a swagbucks code good for one SwagBuck in the toolbar right now – available until 11 p.m. EST today.